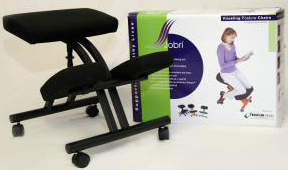 Kneeling chairs were designed upon the ergonomic concept "A strong back is a healthy back". By promoting good posture, the chairs strengthen the lower back muscles helping spinal alignment and support. 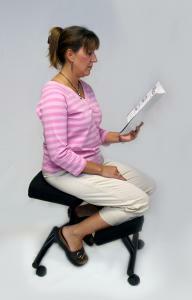 Designed in the 1970's, kneeling chairs are recommended by medical professionals around the world. The chairs have a five year warranty and a maximum weight limit of 280 lbs. 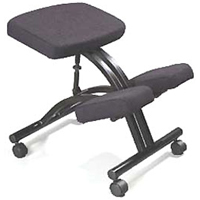 Height range : 21" to 28.5"
Seat size : 17.5" x 12.5"
Knee cushion size : 6.5" x 11"
Lowest seat height : 21"
Highest seat height : 28.5"
Black steel frame with nylon casters. Supportive polyurethane foam covered with durable fabric. Simple and popular, helping to sit up straight. By easing the hips forward, it encourages an upright posture, aligning the back, shoulder and neck, easing discomfort and pain. Foam : 2" supportive Polyurethane foam. Five year warranty : Seat and back structures. Star base. Chair control (steel structures). Structural parts. Casters. All moving parts. Case Box Dimension : 26"x20"x8"